Invisalign® - show off your smile, not your braces Nothing is as important as a genuine and heartfelt smile. Whether in your professional life or when you are out socialising, an attractive smile can make you feel happier and more relaxed - as well as making the right impression! The Inman Aligner is another orthodontic appliance that can fix protruding or crowded teeth in the front of your mouth. The removable appliance aligns front teeth using the forces in the mouth and results are usually seen in a few weeks. 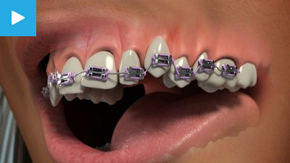 The device works by using nickel titanium coil springs to power its two aligner bows, gently opposing one another and guiding the teeth into position. This results in a large range of movement, which is why the Inman Aligner works so quickly. In most cases, treatment is complete within 6-18 weeks, but for effective results, the Inman Aligner has to be worn for 16-20 hours a day. Our dentists are qualified to deliver Inman Aligner treatment and will be able to determine whether this type of orthodontics is suited to your needs. After an initial fitting, you will need to come back every two to three weeks for check-ups and to ensure your teeth are moving correctly. Clear Aligner is a clear removable cosmetic appliance designed for minor teeth movement of patients 14 and older. Clear Aligner technology can straighten teeth that are crowded, rotated, tilted forward, backward using exact impressions taken by dentist and custom-made, Clear Aligner are fabricated from the impressions at each and every 6 week treatment interval. Thousands of dentists are treating patients with Clear Aligner and you can too.